There is always a rainbow at the beach. Your mommy is always with you. And those big bright shiny things in the sky? That’s how bright the stars are at the beach. Sometimes you see shooting stars, too. Your rainbow protects you from their fall. Your mom carries a sand bucket and a shovel for you at the beach, too. Oh, and mom is green. Either green was the only crayon available or Piper watched the Wizard of Oz at the beach for the first time. But, really, if your mom was a witch, would she carry your sand castle making implements? I don’t think so. 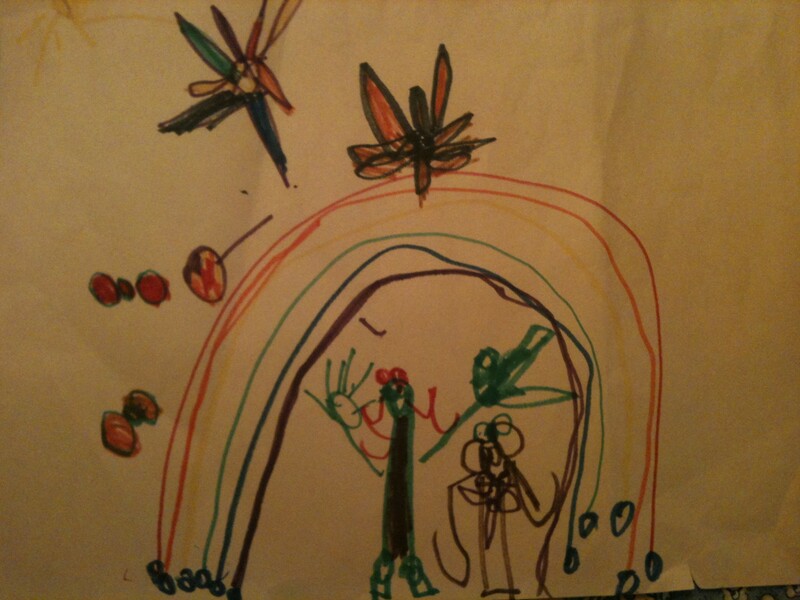 This entry was posted in Antics and Adventures and tagged beach, kids drawings, motherhood, piperism, rainbows, sand castles, shooting stars, wizard of oz by melissa.scholes.young. Bookmark the permalink. Well grandma would carry all implements if necessary. And who won the beach sand castle contest???? Grandma is a good grandma. Beach sand castle contest? That was so 2012. Melissa, Jill and I are hooked on Piperisms. We are in the Miami airport waitng to fly to Bogota for the second semester at CNG. If we are lucky, we will see Piper’s special rainbow. Oh, Jill and Dave. Saudade de voce! So glad to hear from you. Glad you’re enjoying piperisms. As you can see, she cracks us up. She’s the kid I didn’t know I needed. Such a blessing. She fills our house with giggles. In Piper’s world, there are rainbows everywhere. Hope you find one. We love and miss you all so much! Me, too. It always protects Piper in her pictures. Love it.